If you are a former student and would like to comment on the training, or to offer feedback please click here. We update the site often and your comments are important. Based in the Eccentric Principles, Eccentric Performing for theater professionals is a physical approach to acting and comedy. The workshop initially addresses three areas: balance and control of the space, meeting and establishing complicity with the audience and with partners, and problem solving as a method of working on stage. After this introduction, we will explore ways of creating material and finding character. The focus is on activating the internal emotional state of the audience and helping the actor to always be interested rather than interesting. Avner is one of the world’s leading teachers of physical comedy. He is on the permanent faculty of the Celebration Barn Theater, Maine’s International School for the Performing Arts. 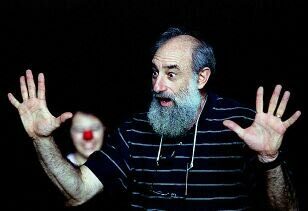 He has taught Eccentric Performing and Clown workshops in the US, Switzerland, France, Germany, Finland, Spain, Mexico, and Japan. Avner graduated from École Jacques Lecoq in Paris. You may even recognize him as the Jewel from the movie, The Jewel of the Nile. Avner has been performing his one-man show, Exceptions to Gravity, for over 30 years. This intriguing workshop will give participants a firm grounding in physical comedy techniques. For the working professional this is a unique opportunity to take a fresh look at old habits and hone advanced skills. Based on Avner’s exciting work with actors and comedians, this workshop gives the teacher a new understanding of body language and ways to use and provoke laughter in the classroom.